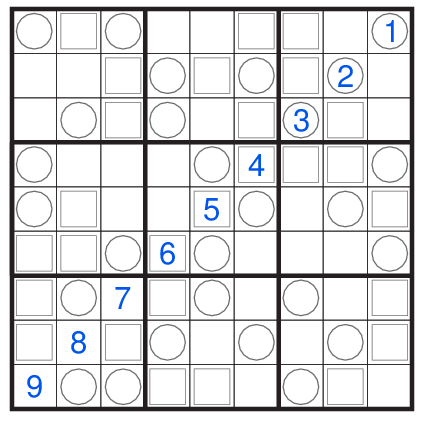 Remember that you can solve this puzzle from the League online on the Sudokucup Guest League page with a 24 hr delay. The design concept inspired from the Trio Sudoku recently appeared in July Beginners Sudoku Contest on LMI orgainzed by Rohan Rao. Place numbers in the grid such that each row,column and 3*3 box contain the numbers 1-9. Additionally, some cells will have circles inside and some others will have squares. Cells with circles must contain the digits 1,2 and 3. Cells with squares must contain the 4,5 and 6. Blank cells must contain the digits 7,8 and 9.